Tonight’s the Big night for the 1st Annual Power Bash at the Waikiki Shell. On Thursday, Iggy Azalea and U.G.L.Y stopped by Power 104.3 for some interviews. Today, I have the approximate times that everyone will be hitting the stage. I always like to know ahead of time who is playing when so I can time my day out. So, figured you might want to know too. (These aren’t exact times, but pretty close) See you later tonight at Wet n Wild, then at the Power Bash. Streetzblog’s got the 411 on one of the biggest concert events of the Summer in Hawaii 2013. 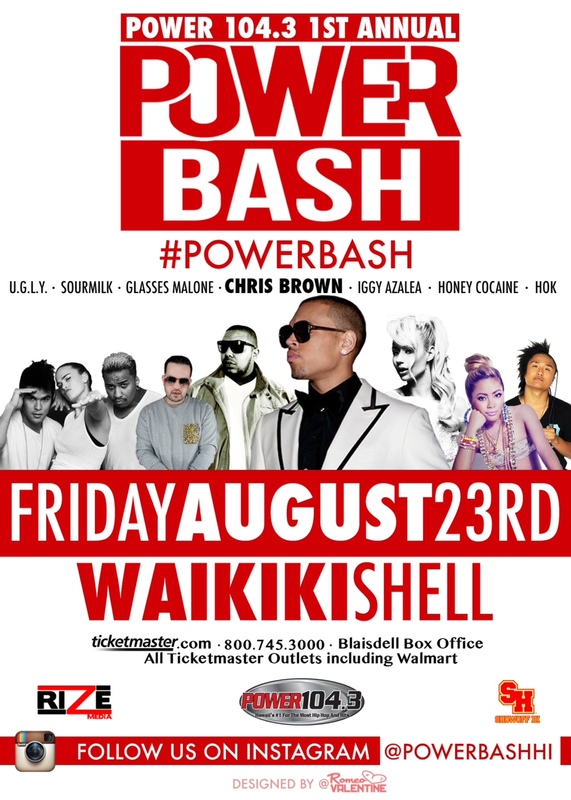 Chris Brown, Honey Cocaine and Glasses Malone are set to fly over to our island of Oahu in a few weeks for the 1st ever PowerBash. August 18, 2013 update: Chris Brown, Iggy Azalea (“Work”), Honey Cocaine ( One of Tyga’s Artists), Glasses Malone (YMCMB), DJ Sourmilk (World Famous Dj from Power 106 and the LA Laekers), HOK (LMFAO Choreographer/Dances in Chris Brown’s “Fine China” video), U.G.L.Y (Local boy AKA Braxton Olita/Signed by Chris Brown/Former drummer for Ashley Simpson). Tickets for the PowerBash go on sale now at ticketmaster.com. For more information follow #powerbash on Instagram, Facebook and Twitter. And check out @streetzpix on instagram for some backstage shots once the big night begins. Now, I gotta’ bust out my XBox Kinect to work on my dance moves to get ready for the BIG show. See you on the streetz or at the Show. And don’t forget to say “Hi” this Saturday July 20th at the Love Festival at Kakaako Park. I’ll be wearing my black Patent Leather Jump J75 Kicks with a special Love Fest Streetzblog shirt. See you soon!